The Fisher-Price TRIO King's Castle allows your child to be the architect of his or her very own castle. Designed for children ages five to nine, the set contains over 200 easy-click bricks that can be used to build custom castles. With six figures, a working cannon, and other accessories included, the King's Castle will immerse your child in a world of medieval fantasy, and encourage imaginative play. A Customizable Medieval Adventure King's Castle features the all-new TRIO building system. Using easy-click bricks, pegs, and panels, TRIO makes it possible to build a wide variety of different structures -- ranging from castle parapets to catapults. Best of all, the system is easy for kids to work with, and requires very little force or finesse. They'll be able to hear and feel the "snap" when they've made a connection. The set comes with easy-to-follow instructions on how to build several different castles. Children can choose to follow these examples, or build a castle of their own design. 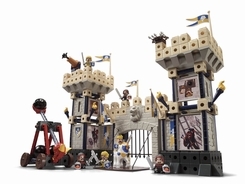 The set also comes with several unique building components, including a working drawbridge, a breakaway wall, and several graphical panels that can be switched depending on the situation. However, the panels are a bit tricky to snap into place, so adult assistance might be necessary. Encourages Creativity and Imagination Once the castle is built, King's Castle has plenty of accessories to offer for creative play. The set has a spirit of medieval adventure, and comes complete with six knight figurines and a horse. All knights come with shield and sword accessories, and can easily be snapped onto the surface of the castle. Kids will enjoy acting out sieges against the castle using the included catapult and battering ram. Or, they can play the side of the castle defenders by operating the working cannon to fight off invaders. So, whether they are building or playing, King's Castle provides children with the tools needed for an immersive and imaginative experience. What's in the Box Easy-click bricks, pegs, panels, drawbridge, cannon, six figures, six shields, six swords, horse figure and instructions.